First Choice Cleaning Company specialises in commercial and residential window cleaning in London. Window cleaning can be a rather tedious and complex task, often best left to the professionals. Our experts know that nothing can quite beat the uplifting atmosphere, created by well-cleaned windows. Natural light helps you focus and does wonders for the mood, be it at home or in an office. Get in touch today and enjoy a refreshing atmosphere without having to lift a finger thanks to the efforts of our window cleaning in London experts. Our professional services, related to window cleaning in London are carried out by certified and insured experts, thoroughly trained and appropriately equipped. We value safety above all else. This is further enforced by our policies, encouraging all of our employees to uphold high standards of Health and Safety. With our expert team for window cleaning in London, you can benefit from affordable and timely solutions. As a dedicated provider of window cleaning in London, we take great care when screening and choosing our employees. Our workers come with high qualifications and professional expertise. Our teams for window cleaning in London are composed of specialists in all areas of window maintenance. Regardless of whether you need the windows of your flat washed or the entirety of your business floor taken care of, we have your back. No task is too big or too small for us. As long as the situation does not require the breaking of our Health and Safety policies, you can rest assured that it will be taken care of post-haste. We can also provide you with no-obligation cleaning consultations, should you be in need of them. In any sort of business environment, windows are of vital importance. After all, you only get one chance to make a first impression. By allowing our cleaners to take care of your windows, you are not only saving time and resources but also improving your business! Having potential customers, partners or employees enter a well-maintained room proves that you and your organisation are really dedicated to your business. Of course, hiring an in-house cleaner is always an option, but can rarely be justified for small and medium sized businesses. Our teams can provide daily sessions of window cleaning in London for businesses. We also offer weekly and monthly cleaning sessions for back office windows as a part of the same service. Our teams ensure the frames and glass of your windows are clean, making the most out of the natural light available to you. Before proceeding with the washing, our experts give them a good dusting, removing any cobwebs or debris that might have built up. This window cleaning technique is especially important during the winter months. 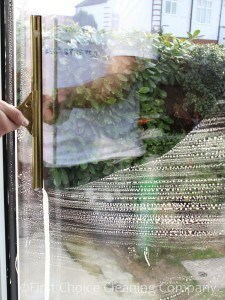 If your windows are fitted with fly screens, we will also brush and wash them for you, as a part of the same service. Choosing the right provider of window cleaning in London allows you to sit back, relax and enjoy the positive effects of a job well done. Quality services kept up to a high standard. As a dedicated provider of window cleaning in London, we offer a 100% customer satisfaction guarantee. A friendly and outstanding customer service. Call us today and benefit from a complimentary consultation about our Window Cleaning in London services! If you are unsure of what type of cleaning would benefit you the most, our customer support will be happy to help. Call us now and see how you can get the best benefit from our window cleaning in London package! And if you wish to know more about our other services, feel free to e-mail us or call us on 020 3819 5735. Phone: 020 3819 5735 | Go to End of Tenancy Cleaning Service.